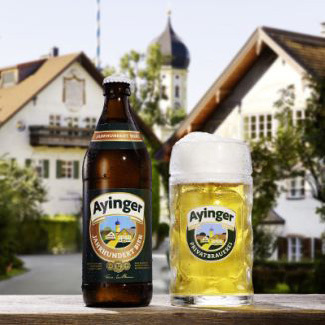 Ayinger Privatbrauerei has a long-standing reputation for excellence in beer for over hundred years. In the foothills of the Alps, nestled in the 1200 year-old village of Aying (pronounced eye-ing), Ayinger produces almost 20 different styles of beers, more than most of the larger breweries. The brewery has been owned and operated by the same family since 1878. In Germany, Ayinger is considered a benchmark of excellence. Key factors for the quality of Ayinger beers are the raw ingredients: water from an Ice Age aquifer; barley from local farmers around Aying; and hops from Hallertau all of which according to the Bavarian Purity law. 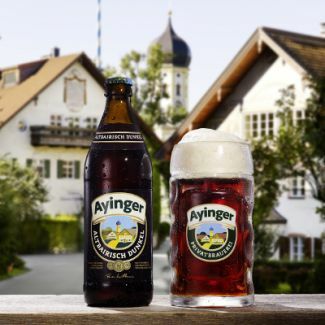 Strong financial, social and cultural commitment for the well-being of all concerned is therefore firmly incorporated into the production of our Ayinger beers – in the company, in the community and in the entire region. 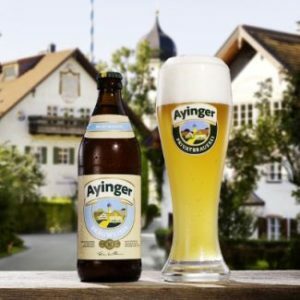 Beyond the realm of the world-famous Ayinger beer specialties, these crucial components have also contributed to creating a unique brand name philosophy: “Aying, a Complete Work of Art”. 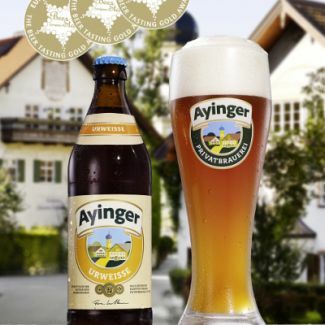 Ayinger regularly places first in every category entered in the World Beer Championships; the brewery has gold medals from the European Beer Star and awards all over the world. 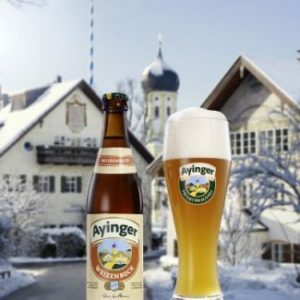 In 2015, ratebeer.com listed Ayinger as the “best brewery in Germany” based on thousands and thousands of consumer rankings. A rich, dark elixir with cascading layers of malt complexity balanced by elegant hops. Full-bodied beer with notes of toffee, coffee, caramel, dried fruit and elegant dark-malt roastiness, and pure malt but surprisingly dryness in the finish. Hallertau hops provide an aromatic and rounded bitterness. The long maturation contributes to the harmonious complexity of the beer. 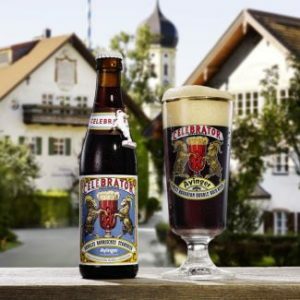 Ayinger Celebrator has been ranked among the best beers of the world by many institutes all over the world. This beer was first brewed to commemorate one century of brewing in Aying Bavaria, in 1978. Golden with a slightl yeast, a honey-like aroma with light flowery hops bouquet with a soft, medium body and a long lingering finish with dry hop tones. This lager is a better complement to food than the higher hopped and more bitter pilsner style. Wheat beer has always been known as an elixir or tonic, a very popular beer style, in Germany and around the world. Pale color, tart in palate, “brut” beer with a delicious, inviting wheat body and elegant aroma and taste of the “yeast-cloudy” wheat beer are distinguished by a refined top-fermented flowery-yeast character and an unmistakable, distinct banana aroma. Finishes with a subtle spicy note. The sparklingly refreshing Ayinger Bräuweisse will impress every wheat beer connoisseur with the first mouthful. Brewed from the finest dark wheat and barley malt, amber in color, dry in palate, very fruity aromas, bursting with flavour. A complex beer with suggestions of orange, apple, banana, and, in the finish, perhaps even cloves. “The union of wheaty freshness and dark malt often produces a fullness of taste and complexity”, explains the world-famous English beer commentator Michael Jackson. 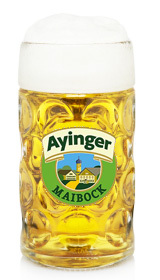 Ayinger Urweisse has won major beer awards from all over the world. This Bavarian “spring celebration” beer is brewed in the fall and lagered over the winter. Light gold color; full body; huge malt aroma and flavor with spicy, aristocratic Hallertauer hops in abundance. Clean lager fermentation and months-long lagering mean that every nuance of flavor – as well as the signature Ayinger malt elegance – shine out of your glass. Classic Bavarian weissebier aroma suggesting spice and cloves; smooth body from wheat and from open-fermenting conditioning. Our winter specialty is brewed with four different malts and wort separation method. The flavor offers the essence of the wheat harvest, fresh-baked bread, maybe even the sunshine of a fall afternoon. The finish is tropical fruit, cloves and banana.